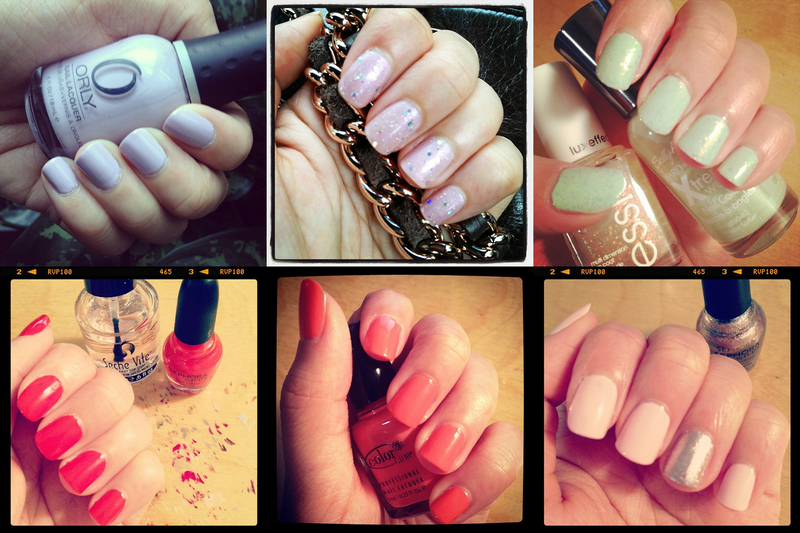 I have been on a nail polish kick the past few weeks and Instagram allows me to easily snap photos of my manicures. Honestly it drives me insane that my point and shoot tends to capture all my nail flaws (gross cuticles, etc) so I appreciate how Instagram instantly makes my hands and nails look better! 1) ORLY Dance 'Til Dawn - This is one of my oldest nail polishes and one that I sport whenever the weather picks up. 2) Sephora by OPI Dear Diary (LE) layered with Maybelline Lilac Luster (LE) and Beauty Credit Silver Crystal - I don't like the look of the Sephora or Maybelline polishes by themselves because they are too sheer so I layered them and topped the nails with a sparkly glitter. This still looks really sheer in real life which kind of bugs me but it looks decent in photos! 3) Sally Hansen Xtreme Wear in Mint Sorbet layered with Essie Shine of the Times - I love mint nails and somehow layered a flaky polish over this one makes it much more wearable. 4) Sephora by OPI Say It Ain't Soho (LE) - You can't go wrong with a bright warm red nail color. This is one of my favorites although I'm sad it's limited edition. 5) Color Club Clambake Coral - I received this in my March Birchbox and I love the shade. It's the perfect summer orange nail polish! 6) Milani Paradise Pink with Sephora by OPI Let Them Eat Cake (LE) - Whenever I want to spice up a mani, I rock a little glitz on my ring finger. Speaking of nail polish, I just ran out of space in my polish storage.... Guess that means I'll have to start using some shades up or maybe increasing my storage space... heh. If you're curious, I store my nail polish in an old tissue box which I cut the top off of. I also store my samples in another old tissue box. Reuse, Reduce, and Recycle people! What are some of your recent favorite nail polishes? How do you store your polishes? I really like the mint combo. Looks really good on your nails.